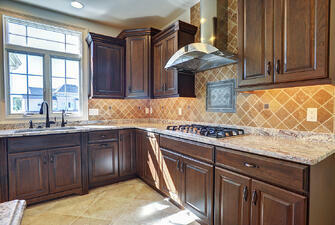 Kitchen cabinets are usually the costliest part of your kitchen. Luckily, you can keep them in excellent shape by following these care tips. Regular cleaning is the key to keeping kitchen cabinets clean and dust-free. It’s easy to forget about this important maintenance task if you don’t add it your calendar. Plan to clean cabinet doors and drawers every two weeks and the entire cabinets, inside and out, every six months. Your cabinets are the focal point of your kitchen. One scratch, even a little one, can detract from the room’s appeal. Choosing appropriate tools will help you avoid accidentally damaging your cabinets when you clean. Soft cloths and brushes are ideal for cabinet cleaning. Avoid stiff brushes, particularly those that contain metal, and abrasive sponges or scouring pads. Make the job much easier by cleaning your upper cabinets first. If you save these cabinets for last, dust and grime can settle on your just-cleaned lower cabinets. It only takes a few seconds to remove dust from the top of cabinet doors with a soft cloth. If your cabinets don’t extend to the ceiling, dust the tops of the cabinets too. A small hand-held vacuum can simplify this job. Use a mild cleanser or a solution of warm water and dishwashing liquid to clean cabinet fronts. Even if you use your range hood every time you cook, grease can still settle on your cabinets. If you don’t remove it regularly, it will harden, making removal much more difficult. Dip the cloth in water and wring it out thoroughly before you pass it over your cabinets. Using an extremely wet cloth may cause the wood to swell, which can warp cabinet doors and frames. If you have white or light cabinets, you’ve probably gotten into the habit of wiping up spots as soon as you see them. Unfortunately, it’s much more difficult to see a few drops of coffee or a smear of jelly on dark cabinets. If you encounter crusted-on stains, go easy on the elbow grease. Scrubbing too hard may damage the finish of your cabinets. Instead, run your cleaning cloth under very hot water and rub the spot gently. You may need to wet the cloth with hot water several times, but eventually you’ll get rid of the caked-on stain without damaging your cabinets. If a stain is particularly resistant, try applying a paste made of equal parts of warm water and baking soda. Baking soda is a mild, natural abrasive that’s helpful for getting rid of many types of kitchen stains. Glass-fronted cabinets require special care. Spray a small amount of glass cleaner on a soft cloth and gently rub first the inside then the outside of the glass. Avoid spraying the cleaner on the glass directly. If you do, the product could drip into the door frame and warp the wood. Handles, grooves and recessed edges require extra attention. A toothbrush or artist’s brush offers the ideal solution when you need to clean small objects or tight spaces. Simply dip the brush into your cleaning solution and attack those hard-to-reach spots. Although you may be able to clean the fronts of your cabinets in as little as an hour, depending on the size of your kitchen, deep cleaning requires a more significant time commitment. Plan to spend at least a few hours on the job. Before you deep clean, empty cabinets and drawers and remove shelf paper. Because cabinet interiors are usually only exposed for a few seconds when you take out a dish, they won’t be as dirty as the exteriors, although crumbs and dust can work their way into places you may never have expected. Clean the interiors with the same gentle cleaning solution and a soft cloth. Don’t forget about open shelving. Clean both sides of the shelves and wash the dishes you display on them. We hope you find these kitchen care tips helpful, but as always, make sure you check your with the manufacturer of the cabinets for their specific care instructions and advice! Does your kitchen still look old and worn out no matter how carefully you clean your cabinets? Maybe it’s time to make the move to a brand new home with a gourmet kitchen. All of the kitchens at Country Classics communities feature top-of-the-line appliances, granite islands and beautiful wood kitchen cabinets. Call us today to take a look at a Country Classics kitchen.